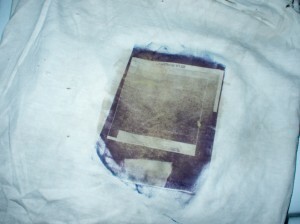 A year or two ago, I stumbled across a product called “Inkodye”. 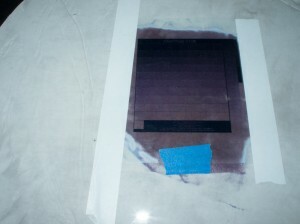 It’s a light-sensitive fabric dye system, which at the time was marketed in something like 12 or 14 different colors. I’ve been interested in trying it ever since, and finally got around to it; last week I ordered their current product line, which is just three colors (blue, red, and orange). I don’t think it’s going to be an even enough exposure for me to get a good scan and negative curve, but it’s enough to tell me that I’m in the ballpark. 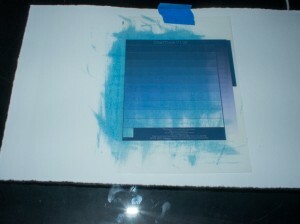 It looks like an uncurved negative, for about 20-30 minutes exposure in my light box, is pretty good. … proving that it works once dried, too. Over the weekend I hope to get scans of both of those and see if I can make ChartThrob curves for new negatives. The tonality of the t-shirt print looks pretty good; the tonality of the paper print looks similar to gum, requiring a fairly high-contrast negative. This is really easy to use. It’s also really easy to not use enough of the dye. It doesn’t brush on well with lightweight foam brushes; it would probably do better with a high density roller. 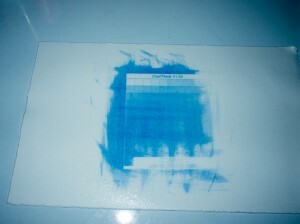 It exposes like cyanotype, as promised. 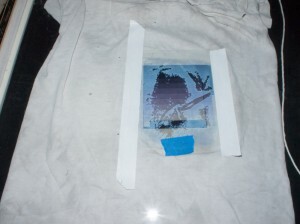 The prints on cotton with wet dye look like they have a good tonality. Prints on paper with dried dye have a much more limited range (this may be because of the drying, or it may be because of the substrate). The dye works even when dry. 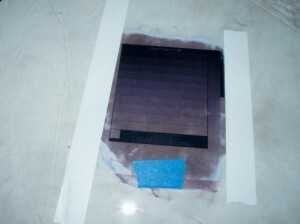 It’s also near-impossible to tell where the dye is when it’s dry, so marking the work area beforehand is a must. 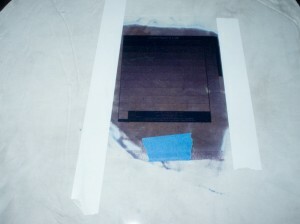 Printing a multi-layer three-color image is going to be a challenge on fabric. You have to wash the fabric between layers and subsequent registration is going to be much harder than paper, since there’s less rigidity. Great reading about your experiments! 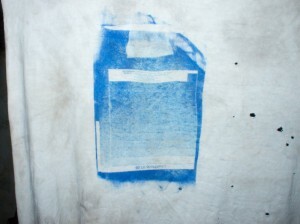 Have you seen these two examples of 3-color process with Inkodye Red, Blue and Orange? No, I hadn’t – thanks!